Over the weekend, I embarked on a long and arduous journey: traversing the wildlands from having all of my pre-21st century gaming material only in physical form to having it in electronic form. This means scanning many pages of notes, characters, maps, etc. - a task which I learned yesterday will more than likely take much longer than I had originally anticipated. I spent almost two hours of quality time with my new "all-in-one" yesterday. The result: 29 pages scanned and three PDF's created. To be fair, the bulk of that time was spent trying to make my older version of Acrobat (5) do something I'd come to take for granted with Acrobat CS: create a PDF from multiple files. Anyway, over the next few days I will post the products of this exercise. Up first, my very first dungeon. At least, I think it's my first. I don't recall exactly that it was my first, but it's from that era (circa 1981) and definitely predates anything else in my Folder o' Old Stuff. Since I saved everything I ever created in that folder, it's reasonable to assume that this is, indeed, the very first dungeon I ever created. Enough blathering. 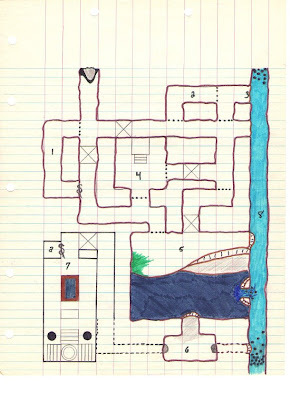 Here, for your viewing pleasure, is the result of my 15-year-old self's first (I'm fairly certain) attempt at dungeon creation: The Dungeon That Shall Not Be Named! I may have an immediate use for this, BTW. Thanks! Okay, this will probably net me a -2 "old school" penalty, but the vertical lines are not my doing. They're as much a part of the paper as the blue ones are. You see, back in the day, paper was a commodity in my house, so I had to resort to swiping pads of paper from my father's desk. IIRC, he got it from where he worked. It had the lines you see, and was slightly taller than 11". I'm not sure what purpose the paper served - perhaps some accounting or technical function - but it was all I could get my hands on in the early 80's. 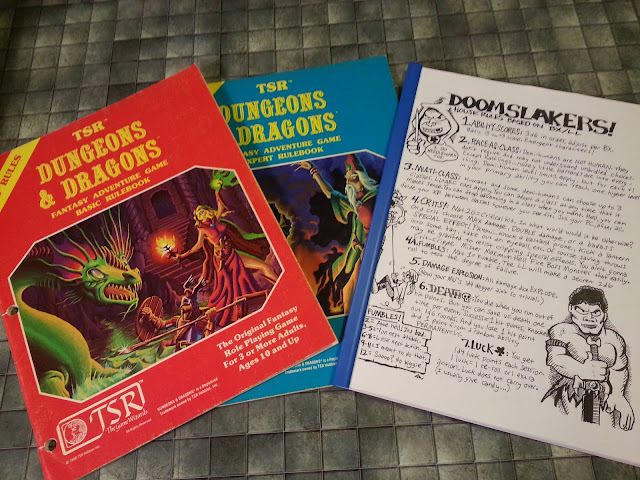 You SWIPED paper with cheesy veritcal lines from you DAD to map dungeons?!? +4 "old school" and a bonus free attack. It would appear to be for engineering. @Murdoc: LOL! Do I get double damage as well? @Restless: Thanks for the leg work. That makes sense, I guess, since my father was a tech writer for GE. @jamused: Please do! Speaking for myself, I love seeing this sort of stuff. It's always fun to see what other folks have come up with. FYI: I've tweaked this a bit and made some major adjustments to area #7 for my Labyrinth Lord campaign. I hope to use it tonight. I will send you a quick write up if I get a chance. Sorta cool to be using someone elses childhood memories. "Sorta cool to be using someone elses childhood memories." Seriously, though, I'm really looking forward to hearing how this works out for you. Following some info picked up in the local tavern (where else) the PCs found the entrance and headed in fearlessly. They were unable to open the first portcullis, so they walked straight into the first pit instead . They climbed out, changed directions and walked right into the second. They hit the river and found the boats but showed no inclination to explore it further. Shortly after this, with a couple characters down yet another pit, a wandering Giant Scorpadillo surprised them and immediately killed a hireling man-at-arms. The elf showed his worth by basically saving the PCs with some well-placed arrows, though, and the dreaded beast was slain. A PC elf showed his strength by managing to open the portcullis to area #4 and proceeded to nearly walk straight into the gelatinous cube. They had encountered one of these hideous creatures in their previous adventure, though, and luckily managed avoid being surprised. The battle was fierce but short, with one of the party paralyzed but everyone else getting out okay. I had added a secret compartment to the side of the platform, and while others searched the walls for secret doors, a female fighter discovered the small panel and revealed a bag of holding and 100pp. They were mystified by the purpose of the platform but eventually gave up and moved on after forcing the southern portcullis. They entered the chamber with the lake and the PC elf immediately spotted the magic shield I moved under the green slime. He noticed some bits of slime on the magical device but ignored it and pulled it free of the stones it was wedged in. The green slime fell on him, but he managed a series of saves and was able to get out of his clothing and armor. He was alive and unharmed, but now owned exactly one boot and his underclothes. He borrowed a short sword from a halfling, a cloak from a cleric, and a shield from a fighter and they continued down to the lake. Spotting the opening across the water, they returned to the boats they had seen earlier by the river and managed to get one of them down into the lake. At this point, the giant crab (replacing the two white dragons) attacked and wreaked some havoc, but a sleep spell saved the day. They climbed into the passageway and were set upon by the orcs in area #6. Again, the fight was tough but the party managed to win. However, they were sorely injured and low on spells, so they retired back to their camp outside the entrance for the night. Now, I had made some major changes to area #7. For one thing, I had no idea what "The Sign" was that the priest summoned, so I changed him into a cursed insane cleric with a scroll of Summon Hell Hound. He chatted with the party for a bit, then pulled a lever to release the skeletons in the secret room. The battle was short (another successful turn by the cleric) but they went to check the secret room instead of dealing with the priest, giving him time to finish his summoning. The PC elf noticed something was amiss and sleeped the priest, but not before the the hell hound leaped out of the flames on the alter. It attacked and took down a couple of party members, but the PC elf (who had recovered the armor from the slain hireling to replace his lost chainmail) and the elf hunter did some major damage with their bows while the fighters closed in for the kill. Luckily for the party, the hell hound's fire breath did little more than singe anyone, and everyone ended up surviving the encounter. The priest was awakened, at which point he kindly healed a couple of wounded PCs, then attacked with a mace. They subdued him and recognized that he was out of control, and after recovering all the treasure they could carry, they took him to a temple where they paid for his curse to be removed. Extra XPs for that. Though the experience point total was a bit low (they missed quite a bit of treasure), three party members climbed to 2nd level. The PC elf did not, but he's thrilled to have the elf hunter as his henchman. All in all, this was a great adventure for the party, and we had a lot of fun playing. I particularly enjoyed running it off of your original scans. Thank-you for sharing. @Murdoc: This is just too cool. :D When I posted this, it was just to share what I consider to be a curious bit of gaming nostalgia. I never in my wildest dreams imagined anybody would make use of it, much less play it mostly as written. And yet it appears that not only did you do so, but you and your group enjoyed it! I'm astounded... :) Thanks so much for sharing your experiences. BTW: "The Sign" mentioned at the end of the dungeon was one of five magical entities, whose immense power could be harnessed by those of strong enough will. They were much sought after, and the forces of good and evil in that campaign setting were constantly at odds to discover a means to summon and control them. We loved it. The previous adventure had left most of the party a little short of 2nd level, and I was thinking maybe a quick side trek was in order to let them level up before the next big thing. With a couple of adjustments, The Dungeon That Shall Not Be Named fit the bill. "What's with all the pits?" they kept asking. I'd just shrug. The green slime was also the first any of the players (young newbies) had ever encountered. They now have a healthy respect for the stuff. I've always ruled that magical items are immune to green slime.